Once in a while the Intel duo core members of The Trip just want to let down their remaining hair and hit the open road, like something out of Two Lane Blacktop but keeping strictly to the limit. Heck, we hook up, strap up and put the pedal to the metal, being sure to indicate at all times. Vroom goes that Chevy 150, albeit substituted by a far more eco-friendly VW. Who knows where we'll end up and why? Impromptu destination is Bella Napoli, slightly inland of Coffeelink. 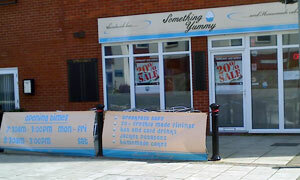 Trying and mostly failing to find somewhere to park, plans change: new eatery spotted named Something Yummy. OPEN, yells the sign. Combination of sun and outdoor seating is defeated by the unfortunate shade. Like Woody Allen, we go for Interiors. Too late for breakfast, you can fill your boots with the available fillings. There's only one for us: Hot Roast Pork. Eating in? Baguette plonked on a bare plate brings Seasons to mind. Spare a green leaf or a handful of crisps to go with our apple sauce-dampened bread? Wot no WiFi, chips in Andy. View from the window is like that from a cheaper seaside apartment, i.e. not on the front but on the next row back. Over the road is yet another place being fitted out, Cafe Marina, continuing the trend for naming after 1970s saloons. No time for a sit-down coffee, so takeaway it is -- ouch, that's hot -- with what turns out to be the best part of the excursion, a really good cupcake. There, a happy ending. Fin. If it was a car -- Talbot Alpine. If they were passing by -- Jake Wood.